Award-winning cartoonist and graphic novelist Ben Katchor will present an illustrated lecture on his work Monday April 4 at Johns Hopkins University. 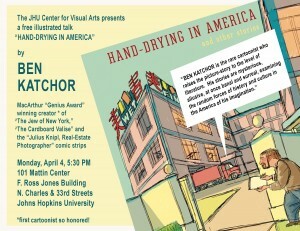 Katchor’s talk, “Hand-Drying in America and Other Stories,” starts at 5:30 p.m. in Room 101 of the F. Ross Jones Building, Mattin Center, on the Homewood campus at 3400 N. Charles St. in Baltimore. A book-signing will follow. Admission is free and open to the public. Subtitled “Picture-recitations from 18 years of comic-strips about architecture and urban design from Metropolis magazine,” Katchor’s talk bears the same title as his most recent anthology, published by Pantheon Books in 2013. Hand-Drying in America and Other Stories was included in Time Magazine and NPR’s Best Books of the Year lists and was named one of The Daily Beast’s Top Coffee-Table Books of 2013. Katchor’s other books include Julius Knipl, Real Estate Photographer, Hotel & Farm, The Jew of New York, The Cardboard Valise, and Shoehorn Technique. In addition to Metropolis, his work has appeared in The New Yorker, The Jewish Daily Forward and numerous weekly newspapers. He has collaborated with composer Mark Mulcahy on six music-theater shows, most recently The Imaginary War Crimes Tribunal. In 2000, Katchor became the first cartoonist to receive a MacArthur Foundation Fellowship. He has also received a Guggenheim Fellowship and is a fellow of the American Academy in Berlin. He is an associate professor at Parsons School of Design/The New School in New York City, where he directs the Illustration program. Katchor’s appearance, his first at Johns Hopkins since 1999, is co-sponsored by the Center for Visual Arts and Homewood Arts Programs.